It took the Wall Street Journal, of all places, to point out a significant way in which hip hop has been evolving. During 2014, the WSJ noted, every hip hop number one album on the Billboard charts was by a solo star. Even within the top 20, there were only two “groups” as such – the Rae Sremmurd duo, and the Rich Gang, which is a concept group dominated by Young Thug and his label boss, Birdman. For a music that so strongly celebrates allegiance to the ‘hood and to one’s homies as a badge of authenticity, that’s a pretty significant change. Contrast the current situation with the glory days 20 or 30 years ago – when hip hop was almost entirely a group thing, commonly made by people who grew up together, and fought with/inspired each other : A Tribe Called Quest, Run-DMC, Grandmaster Flash and the Furious Five, Public Enemy, NWA, Wu Tang Clan, Bone Thugs, Cypress Hill etc etc etc. By contrast, modern hip hop is almost entirely the work of solo stars – Jay Z, Kanye West, Drake, Kendrick Lamar, T.I., Young Thug, Future, Li’l B etc – who may guest on each other’s albums, but only as visiting emissaries from planets of their own. Each will have their own posse, but those crews are less engaged in the creative process than when say, Q-Tip and Phife Dawg were sparking each other in A Tribe Called Quest. “It’s more money in the solo play,” Ice Cube told the WSJ. “The royalties don’t go up for how many members you have in the group.” Solo artists are also easier for the industry to manage. Just sayin’… this month’s column isn’t an attempt to overview the classic hip hop era – ie, from the mid to late 1980s until say, the landmark year of 1994 when a fantastic profusion of new albums and artists defined the music we know today. Instead, this column is a personal mix of one hit wonders, old school heroes and a few modern tracks of note. It’s like that, and that’s the way it is…. I know, I’ve tried to push the virtues of Juvenile’s “Ha” on you before but…that aside, these two late 1990s videos both celebrate family, neighbourhood and community and use compellingly beautiful images to do so. (The Magnolia Gardens housing estate/ghetto featured on “ Ha” largely got wiped out by Hurricane Katrina.) At the time, the success of “Ha” was crucial to the rise of the Cash Money label – and thus to the career of Li’l Wayne, who can be glimpsed as a kid in a red shirt near the end of the video, and to the ongoing business success of Birdman, the man behind current star Young Thug. On the “ Father” track LL Cool J’s hammy sentimentality can be over-bearing, and he’s a terrible actor. In his defence though, he is talking here about his own well documented troubles with his absent and/or hyper-violent Dad. For once, the “Father” track is a case of a black artist sampling a white one. Yes, that’s George Michael’s “Father Figure” playing in the background – but then again, the British singer was trying to fashion a faux black gospel track, so it all comes around in the end, back home. 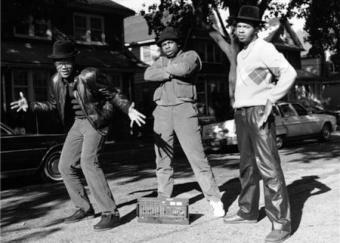 The terrific documentary Beats, Rhymes and Life paid fitting tribute to the role of A Tribe Called Quest in hip hop’s evolution. Along the way, it illustrated the creative tension between the charismatic gifts of Q-Tip on one hand, and the dogged tenacity of Nate Phife on the other – with Ali Shaheed always somewhere in the middle as the peacemaker/co-ordinator. Here’s a few of their classic tracks. Arguably, “Scenario” gets owned by the dynamic arrival of the young Busta Rhymes – yet another product of the loosely affiliated Native Tongues collective that also included De La Soul and the Jungle Brothers, as well as Quest. The Native Tongues output was grounded in neighbourhood realities and in elements of Afrocentrism. It was also forcefully positive, and good-humoured : “I Left My Wallet in El; Segundo” for instance, is a very likeable showcase for Q-Tip, and it indicates how – from the outset – Latin and jazz elements were a factor in the ATCQ /Native Tongues mix. Born in Jamaica raised in New York, Chubb Rock made a string of hit tracks in the late 1980s, early 1990s. “ Treat ‘Em Right” was probably the best of them, although his 1989 breakthrough “ Ya Bad Chubbs” also had its moments. On “Treat ‘Em Right” the bragging rhymes switched to this likeably modest message about the need to keep in touch with the community. If only for financial reasons. 6. Raekwon : “Knuckleheadz” Despite a few dry patches along the way, Wu Tang Clan have racked up a terrific 20 year run of collective effort and solo projects. Raekwon’s “Knuckleheadz “ was the opening track on his mid-1990s critical and commercial smash Only Built 4 Cuban Linx. While Raekwon and Ghost Face are the bigger names, to me the third verse (by U-God) was the peak contribution here. Overall, the track serves as a good example of Wu Tang’s brew of aspirational Mafia lifestyle, comic book lore, Hong Kong kung fu movies, hedonism, consumerism ( eg, the Pelle jackets)… all of it sitting within some very particular New York neighbourhood stuff. U-God for instance, name-checks the children’s Skelly street game, which reportedly dates back to 1892) and even last line contains an echo of Duke Ellington’s “Take The A Train”… Tellin’ the seeds about the sagas, for sure. 7. Big K.R.I.T “ The Vent” Is regionalism also a form of the old hip hop community that’s disappearing ? Maybe. Regional styles do still exist…though they’re waning now that styles and production advances get disseminated so quickly and universally. For random instance, Atlanta’s golden run of talent from Outkast on through to Killer Mike and Future now seems to have run dry…. Chicago’s Chief Keef and his studio collaborator Young Chop have also not been the force in 2015 that they were two or three years ago. On the other hand, the A$AP Rocky/A$AP Ferg crew from Harlem has bounced right back this year, in the wake of Rocky’s mediocre second album. One regional artist (he’s from Mississippi) who I’ve always rated has been a young guy called Big K.R.I.T – who’s been a consistently strong practitioner of melodic, socially conscious Southern rap music. “The Vent” is four years old now, but its where K.R.I.T spoke most directly and sincerely about his family, and the values it taught him. Finally….of all the current young hip hop acts, Joey Bada$$ ( he’ll be 21 in January) has been the one most closely associated with Old School stylings. In 2015 that’s a mixed blessing, and ihe’s been seeking to widen his range. “Good Knight” came out a couple of months ago – and yet….its still not a million miles removed from a Tribe Called Quest rhythm and arrangement. Maybe the collective and the ‘hood is forever. Lets hope so, anyway. Hideous chanting stuff that allows those without any singing ability to pretend to be musicians It’s mix of dancehouse bumngrind with what sounds like an auctioneer or race commentator babbling what is often mysoginistic drivel in the backround. I just cant understand its popularity. What on earth was wrong with the superb reggae or soul as black music? I completely disagree and think it’s a bit misleading to assume that new hip hop artists are somehow less connected to “the hood” because they don’t exhibit old school hip hop mentality. The 90s – early 200’s weren’t great times for hip hop in terms of social progression, but these days you can find plenty of artists who represent very diverse and progressive ideology through their music. It’s also important to recognise the diversity in the genre, which was almost non-existent during the times of the “greats” you refer to. There are plenty of hip hop groups (Run The Jewels, Ratking, Das Racist, Death Grips, Odd Future) that are young and represent a new school of thought; however one that is completely in line with community mantra you believe has become non-existent. It might also pay to refer to our local hip hop community, which is rife with incredible groups who are deeply connected to their roots (Team Dynamite, @Peace, Homebrew et al).